Shorter product life cycles, more aggressive competition and unforeseen demand fluctuations demand more than ever before to react quickly and flexibly to market changes. On a trip to the USA, I became aware of “Barter”. The Internet and electronic marketplaces make it possible for many small and medium-sized companies to trade and settle their goods and services through “barter exchanges” using their own currencies. They open up new markets so cheaply and realize liquidity advantages. In the following, I would like to explain how Barter works with a practical example. Cynthia McKay, a lawyer in San Francisco, has set up her house by an interior designer, an installer has renewed her heating system and a gardener has laid out her garage roof. She also bought her new aluminum rims and wide tires, bought inline skaters for her daughter and took a rental car to the airport to save the expensive parking fees. The special thing is that she did not pay a single dollar for all these things. Cynthia McKay belongs to a worldwide growing number of companies and freelancers, who successfully use an ancient, tried and tested concept in its modern appearance – Bartering. Bartering means nothing other than exchanging its own goods and services for other goods and services without going through the money. Everyone gives what he has, but can not use it himself and comes to what he would like to have. Modern bartering, however, has nothing to do with the original barter. Rather, modern, computerized bartering opens up completely new and unimagined business opportunities. In addition to handling payment transactions, ITEX stores all offers and requests from members in powerful computers. The ITEX headquarters in Portland, Oregon, with its modern data center is virtually an electronic marketplace, where daily offers of and requests for goods and services are received and directed. Whenever there is a need for a service, the relevant ITEX members are informed automatically by email or fax. A barter broker takes the personal care of every ITEX member. He works on the needs of his customers, looks for qualified suppliers inside and outside the Barter pool, strives for new orders for his customers and constantly gives them new ideas for using the Barter system. For its services, ITEX charges its members a one-off fee of 495 dollars and a commission of 5% for each transaction. The advantages of such a multilateral barter system are obvious. As a marketing tool, Bartering offers potential buyers strong purchasing incentives. Is there a more effective sales argument than “Pay me not with money, but with your own performance.” As a financing tool, bartering can be used to pay needed goods and services instead of money directly with their own services. This in turn leads to additional sales, which – if at all – would only be achieved through costly advertising. Each barter dollar spent by a member flows back into his own pocket. The purchasing power of the members remains bound within the Barter pool and leads to sales increases in practically all parties involved. “Bartering works best when a company has to offer excess goods or services that it can not otherwise sell through conventional sales channels,” says Neal. The Barter network gives members access to a market that is closed to competitors. On average, by exploiting this market every single member can realize 10-20% more sales. Particularly in sectors with high competition intensity, Bartering is worthwhile in order to consolidate and expand its own market position. “If I looked earlier in my calendar and realized that my working week was not fully booked, I knew that I had once again lost a lot of fees,” explains Cynthia. She can sell 40 hours of work per week. Her clients have only taken her for a total of 30 hours. Since she sells a working hour for $ 70, she has lost $ 32,000 per year. Not only lawyers have to deal with this problem. Virtually all industries that sell “space” or “time” are affected. Examples of this are a restaurant with free tables, a real estate company with vacant office space, a tax consultant with free appointments or an airline with free seats. If all these “perishable” services have not found a buyer at any given time, then sales are lost for all time. Barter experts call this phenomenon a “vacuum in space and time” and point out that this vacuum can be filled with turnover and profit by bartering. “As an ITEX member, I sell my free capacities for barter dollars.” Cynthia has no problems finding new clients over the Barter network. Previously, like many of her colleagues, she was dependent on references and oral propaganda. Only rarely did a client find her by chance or over the Yellow Pages. Since she is not allowed to act as an attorney, she was bound to actively promote new clients. As an ITEX member, Cynthia has significantly improved its competitive position in the fight for new clients compared to its lawyers. Not only does her Barter broker bring her new clients, she is also listed under the “Lawyers” section in the “Barter Pages”, the official ITEX member directory. 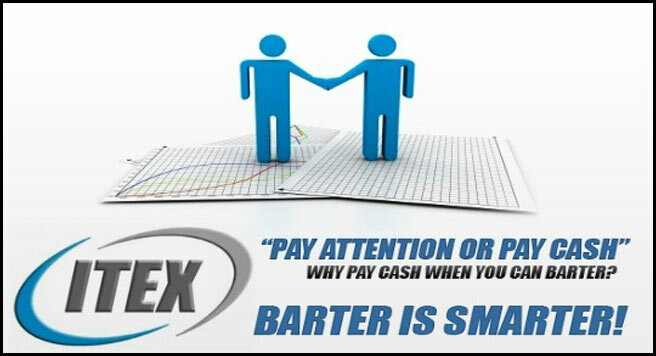 An ITEX member can be directly informed about where it can redeem its barter dollars against goods and services. ITEX members first give the business to another ITEX member before they search for other potential business partners. After all, they can pay cash with a different ITEX member with barter dollars, thus protecting their liquidity while increasing their own sales volume. Cynthia earned about 25,000 barter dollars annually by ITEX. The barter income is used to transfer services from the barter pool and to replace previous cash expenditures. For example, she is now more generous to business partners and invites them more often to the restaurant for business. Since she does not have particularly high business expenses – after all, she can not pay her taxes and taxes with barter dollars – she uses her barter dollars mainly for private needs. The 25,000 cash dollars that have been freed in this way, she invests in the training of their daughter and in her own retirement plan. Even if barter dollars are not a legal payment, the Treasury is watching over all barter activities. Bartering is not an organized tax evasion event. The finance office treats cash transactions as well as cash transactions. Barter income is taxable, barter expenses are deductible. To ensure that the members can keep an accurate record, they receive an account statement from ITEX and an annual account. Not only do we provide our members with strong competitive advantages in the market, but by creating additional purchasing power, the benefits of the division of labor can be better utilized, “explains Neal. He points in particular to young, expanding companies whose cash flow is badly strained. They often try to do a lot themselves because they can not afford an external service provider. Through bartering services become affordable. In this way, the companies realize productivity gains and can devote themselves more intensively to their customers. According to Neal, Bartering will revolutionize the financial system of the 21st century. “Finally, we have more to offer than a bank.” While a bank charges its customers fees and interest for only providing them with the payment, ITEX provides for payment of the services of its members, as well as payment transactions. Since the balances on the clearing accounts are not interest-bearing, ITEX can grant its members interest-free barter loans. ITEX not only assesses the creditworthiness, but also the business potential. The higher the demand for the applicant’s services in the Barter pool, the more generous is the credit line granted. Interest-free barter financing is particularly interesting for young companies. On the one hand, the newcomer can make his first output, e.g. Business equipment and advertising, cost-effectively finance, on the other hand, he is quickly brought into the business by the Barter network. 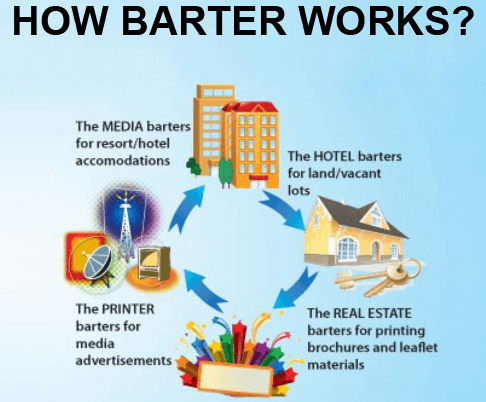 Bartering has already established itself as a marketing and financing instrument in many Western industries. In the US alone, 300,000 companies in 2012 offset $ 9.5 billion over barter. The industry is growing by 20% annually. Especially the spread of the Internet, the increasing use of modern communication media and globalization continue to provide strong growth impulses for bartering. “Bartering is still unknown in Germany to this day, it is remarkable that the world’s largest barter society has established itself in our immediate neighborhood. 71,000 companies and freelancers, ie 21% of all registered companies, are now affiliated to the WIR-System (Wirtschaftsring) in the conservative Swiss region. In 2013, they invested some CHF 3.7 billion. 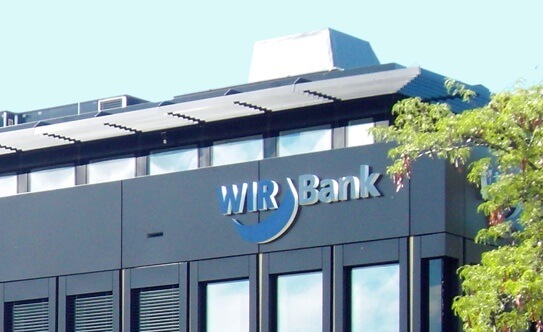 The volume of Swiss barter has already been pushed into dimensions such that the WIR money is even statistically recorded in the monthly reports of the Swiss National Bank and is taken into account in monetary control.